President Donald J. Trump landed in Southern California Saturday with California Gov. Jerry Brown and Gov.-elect Gavin Newsom to tour areas affected by the Woolsey Fire. Air Force One landed at Naval Base Ventura County Point Mugu at 3:07 p.m., and Trump exited the plane with Brown, Newsom, FEMA Administrator Brock Long and California Rep. Kevin McCarthy among others. 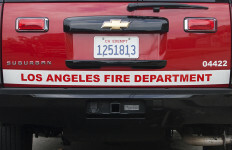 The motorcade left the Naval Air Station at 3:24 p.m. and drove the president to Malibu, where he held a quick news conference with Brown and Newsom at the scene of burned-out buildings. Trump repeated his theory that poor management of forests might have contributed to the size of the wildfires. “It’s just a horrible thing and it’s been going on for a long time, and I think we’re going to come up with some plans and methods and mitigation. … I’m a strong believer that … a lot of cities are in forests if you look at Europe and other places. We have a lot of forest states where they’re mostly forests and they just don’t have this problem…” Trump said. The president said that he’s “heard great things” about Newsom and thinks the two can work together, even pulling the governor-elect closer for a second handshake to prove his point. “I think we’ll meet it. 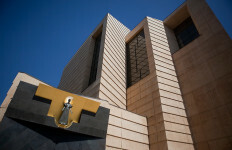 At least, Newsom will meet it — cause I’m going to be watching from the ranch,” Brown quipped to laughter. Trump told reporters after the news conference that he was en route to Thousand Oaks to meet with survivors of the recent fatal nightclub shooting there. 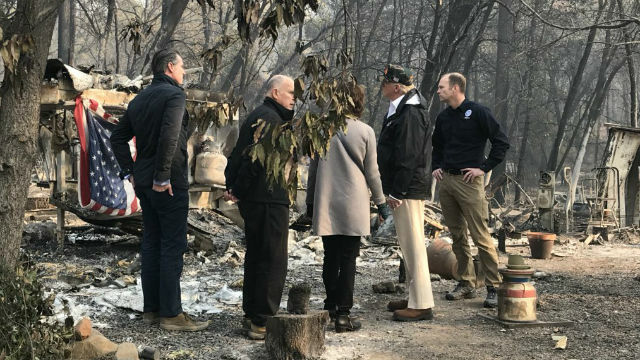 Earlier Saturday, Trump visited Paradise, California, to tour areas devastated by the Camp Fire. Trump — who initially lashed out at California’s forest-management policies as a cause of the destructive blazes in Southern and Northern California — touched down at Beale Air Force Base north of Sacramento at 9:50 a.m. Saturday, flew from there to Chico Municipal Airport at around 10:55 a.m., then rode in a motorcade to Paradise, arriving at 11:35 p.m. to tour an RV park. Brown and Newsom welcomed the president at Beale Air Force Base, putting aside policy differences and harsh criticism from both sides in the past. Trump touched off a controversy Nov. 10 with a tweet that addressed the state’s wildfires. That prompted a flood of angry reactions from public officials, including Newsom. Later, in Paradise, Trump said: “Law enforcement’s been beyond anything that anybody could have believed. To see what’s happened here, nobody every thought this could have happened. So the federal government is behind you, we’re all behind each other. “Jerry and I have been speaking, and Gavin and I have now gotten to know each other. We’re all going to work together and we’ll do a real job. But this is very sad to see. Then, according to a White House pool report, Trump briefly returned to the issue of forest maintenance. “We do have to do management, maintenance. We’ll be working also with environmental groups. I think everybody’s seen the light,” Trump said. “Hopefully this is going to be the last one of these, because this was a really, really bad one. “I know Gavin’s committed, we’re all committed, I’m committed to make sure that we get all of this cleaned out and protected. We’ve got to take care of the floors, you know the floors of the forest, it’s very important,” Trump said. Since erupting Nov. 8 in Ventura County and quickly spreading into Los Angeles County, the fire has charred 98,832 acres and was 82 percent contained with full containment expected Monday. It has destroyed at least 836 structures and damaged 242 others, with about 70 percent of the burn area assessment complete. The Camp Fire has killed at least 71 people and burned 148,000 acres. The president then returned to the Naval Base Ventura County Point Mugu and met with families of 12 people killed in the Nov. 7 shooting at the Borderline Bar and Grill in Thousand Oaks and first responders. “What can you say other than it’s so sad to see,” Trump told reporters. “These are great people. Great families, torn apart. We just hugged them and we kissed them, and it was very warm. “It was tragic and yet in one way it was a very beautiful moment,” Trump said. Air Force One took off from the naval base at 5:47 p.m.